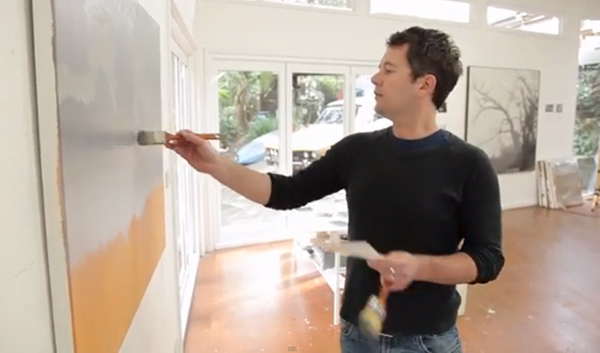 As a descriptive term, abstract painting is a bit vague. After all, both Joan Miro and Jackson Pollock were abstractionists. But Miro expresses an exuberant joie de vivre, while Pollock seems driven by a seething inner angst. 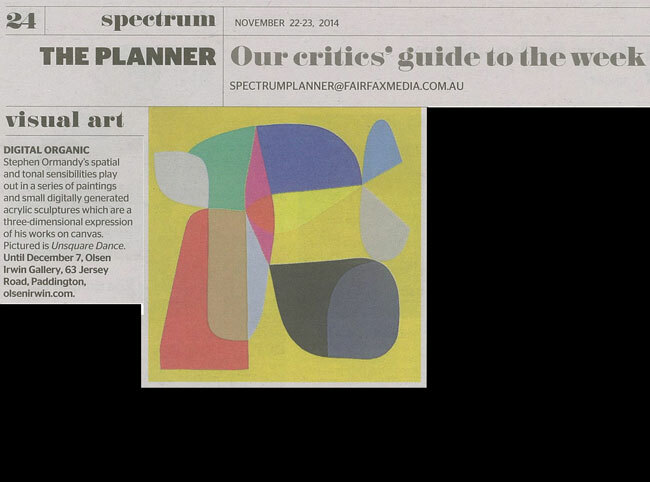 If you had to place Australian artist Stephen Ormandy on Team Miro or Team Pollock, the choice would be clear. Ormandy’s abstraction is uplifting. 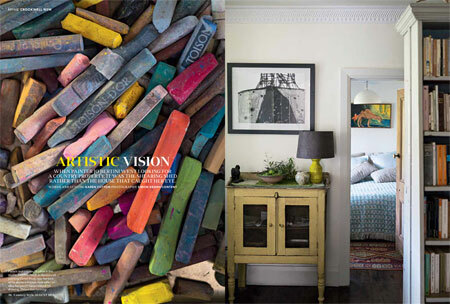 His colourful canvasses are full to bursting with an almost irrepressible cheer. You’ve recently made the move to Los Angeles. How is it treating you? I moved to West Hollywood in February this year with my wife Sarah and am represented by the Heather James Fine Art Gallery. 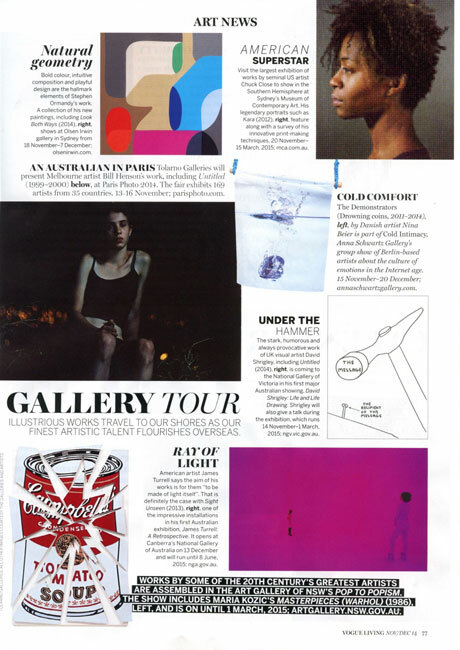 The Gallery deals with new and secondary work from Andy Warhol, Picasso, Yves Klein and Damien Hirst. It has spaces in Palm Desert and Jackson Hole here in the States and I have a solo exhibition at the Palm Desert gallery in January 2015. 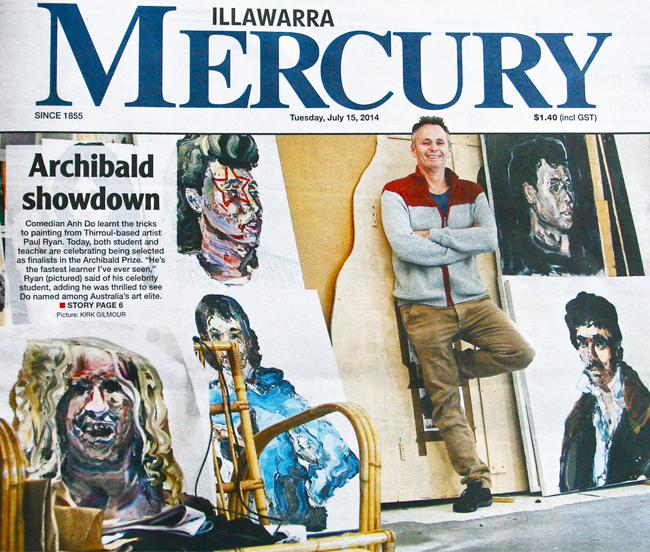 Suburban domestic architecture fascinates Australian artists. Jenny Watson documented street views of five Melbourne houses in which she had lived, titling them by suburb, for example 'Mont Albert' (1975 - 77). 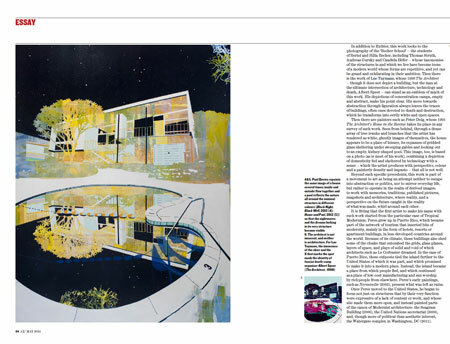 Howard Arkley titled his depictions of suburban houseing ironically, including 'A Splendid Superior Home' (1989). 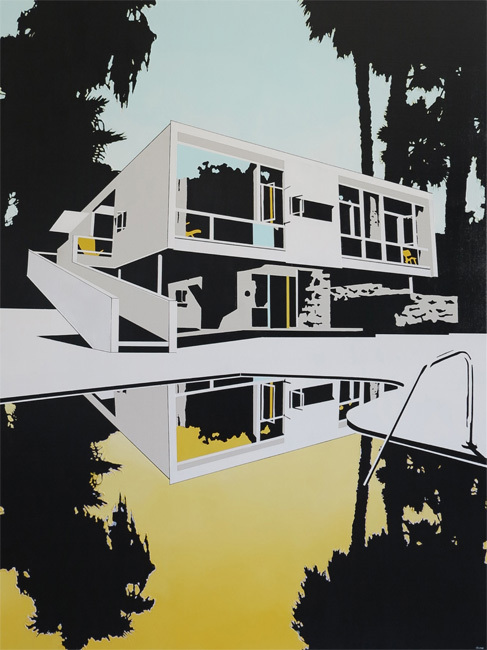 In his first solo exhibition in London, held at the Fine Art Society Contemporary gallery, Paul Davies ups the architectural ante, depicting exteriors of archetypal modernist houses. When painter Jo Bertini went looking for a country property, it was the shearing shed rather than the house that caught her eye. Art District XIII, in Delhi's Lado Sarai, may jostle for space with other galleries, but is different in its attitude. While number '13' challenges the conventional unlucky paradigm, the front road leads into canvases adorning the walls. 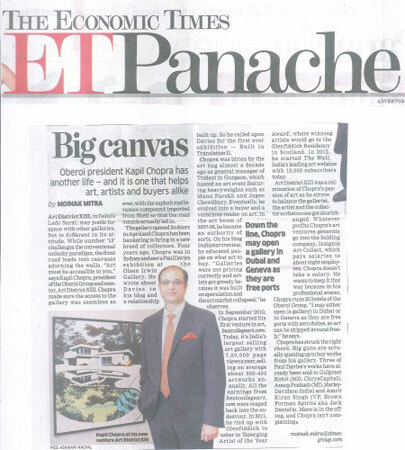 "Art must be accessible to you," says Kapil Chopra, president of the Oberoi Group and mentor, Art District XIII. Downhill skier, sprint cyclist, near-death veteran, serial hospitalcase. 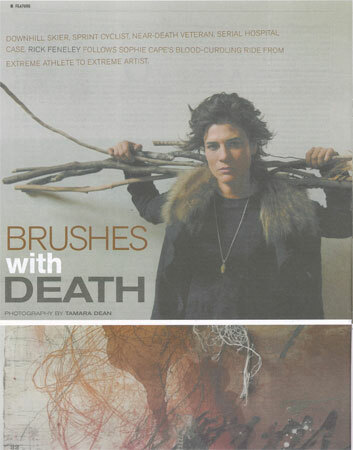 Rick Feneley follows Sophie cape's blood-curdling ride from extreme athlete to extreme artist. Interpreted by painters in many different ways, Modernism continues to be a compelling subject matter and muse that encourages artists to go beyond notions of simple representation and instead seek to evoke something more profound. It began, like many artistic endeavours, in Paris. 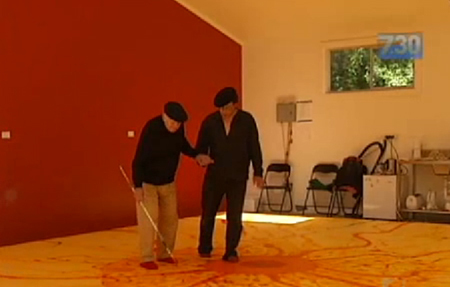 The city where Samuel Beckett wrote En Attendant Godot in 1948, which he translated into Waiting for Godot and later premiered at the Theatre de Babylone in 1953, would draw artist Nicholas Harding into that absurdist drama six decades later. 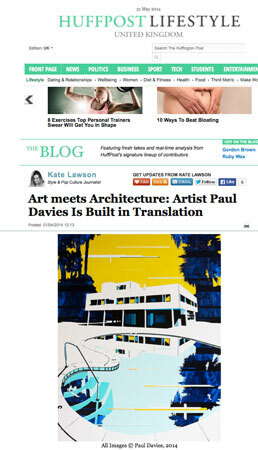 Australian artist Paul Davies' mysteriously vacant homes encourage the viewer to build their own. 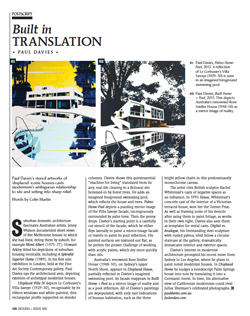 Australian artist Paul Davies first caught my eye earlier this year, with his atmospheric series of paintings which seductively draw you into a utopia that precariously balances between an unforgiving natural space and a built urban environment. 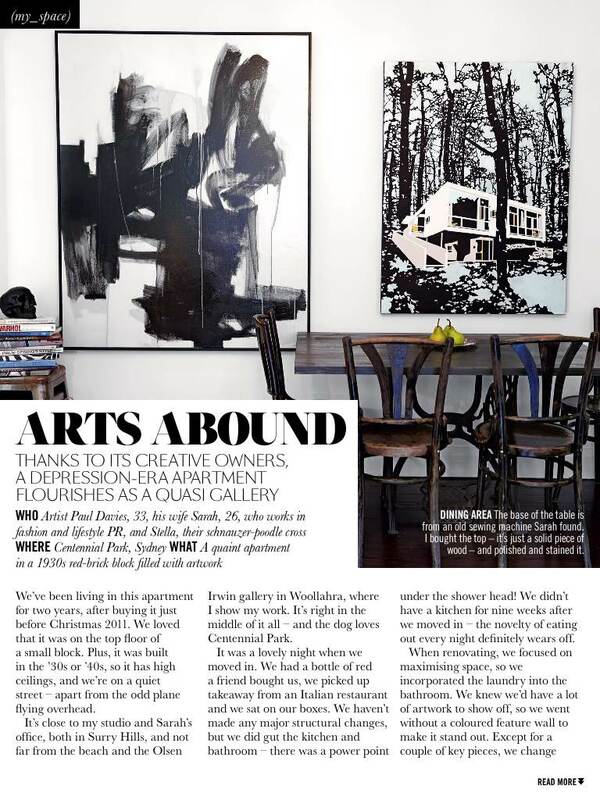 Thanks to its creative owners, a depression- era apartment flourishes as a quasi gallery. 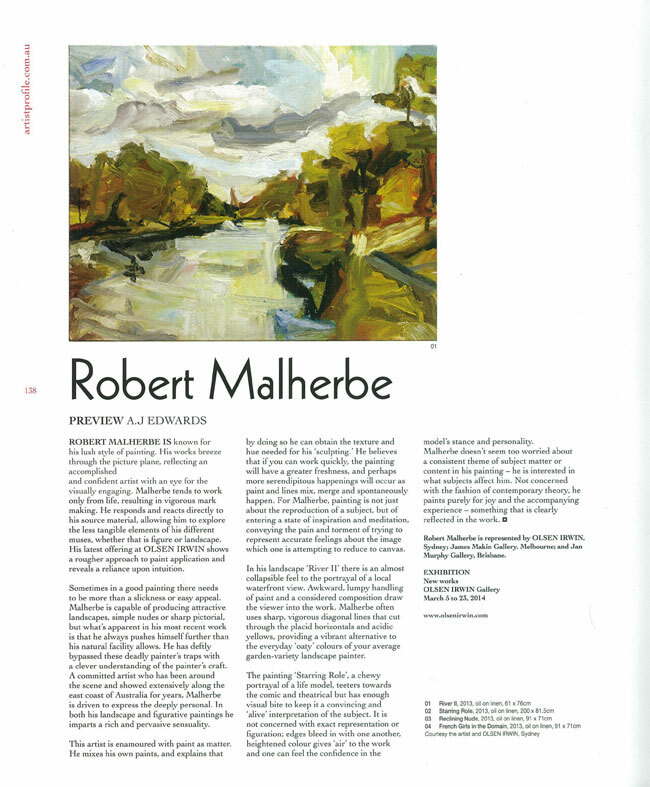 ROBERT MALHERBE IS known for his lush style of painting. 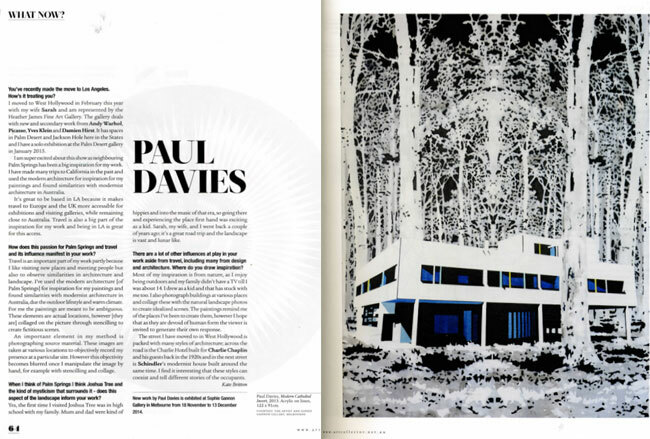 Artist Paul Davies has a fascination with houses and architecture which he explores using stencils and painting. 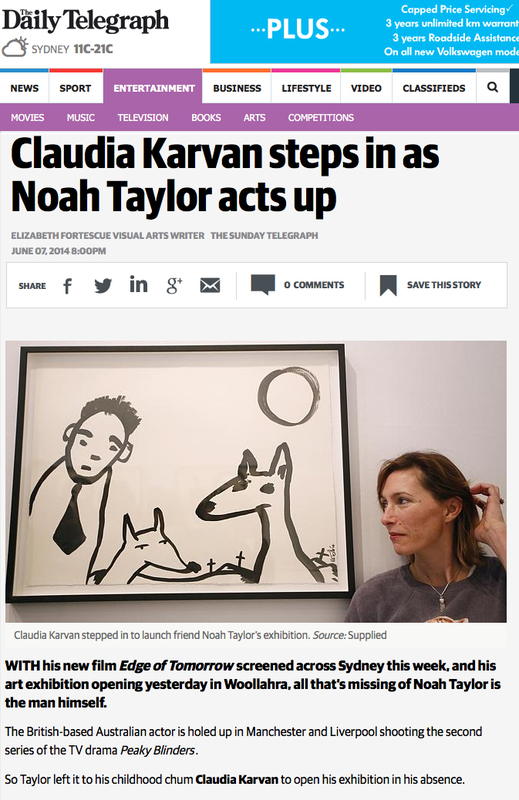 He's dressed down and paint-splattered when working in his Surry Hills studio, but come an exhibition opening, Davies is always one of the best dressed artists. 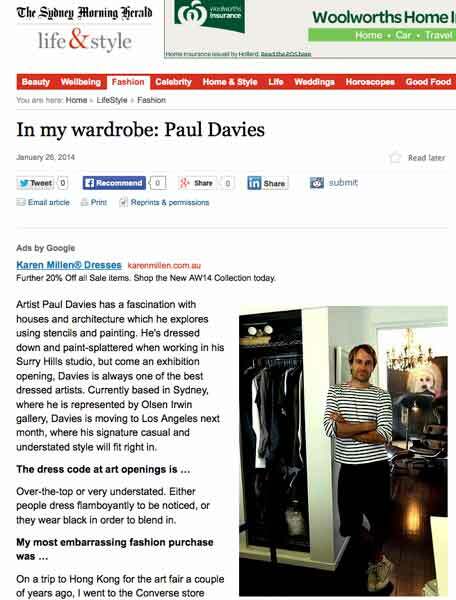 Currently based in Sydney, where he is represented by Olsen Irwin gallery, Davies is moving to Los Angeles next month, where his signature casual and understated style will fit right in.